Grant Fredericks is a contract instructor of video sciences at the FBI National Academy and is one of the most experienced video experts in North America. 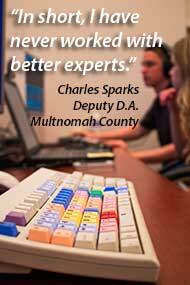 Grant is a Certified Forensic Video Analyst, who has testified as an expert witness over 150 times in courts at all levels. He is recognized as a leading instructor in the science of Photographic/Video Comparison, Reverse Projection and Vehicle Speed Analysis. Andrew Fredericks is a Certified Forensic Video Analyst and 3D Scanning Specialist. Andrew’s expertise in the science of 3D Reverse Projection Analysis results in highly accurate geometric accident reconstruction, suspect height, subject perspective, and vehicle identification demonstratives. He teaches and presents strategies for improved workflows and for the analysis of 3D scene geometries to forensic examiners across the country. Kari Keith is a Certified Forensic Video Technician and Certified Microsoft Excel Specialist. She is responsible for the forensic acquisition and transcoding of digital video evidence, synchronization of multi-source video images, and production of time-calibrated sequences within the Avid Media Composer interface. Kari also assists with the production of 3D scene geometries for traffic accident and crime scene reconstruction projects, and with the construction of demonstrative evidence for court presentations. Brandon Wahl is a Forensic Video Technician. Brandon specializes in the creation of demonstrative evidence for court presentations with Adobe After Effects. He is also responsible for the synchronization of multi-source video images and transcription of audio streams in Avid Media Composer. Brandon also assists with the forensic acquisition and transcoding of digital video evidence.